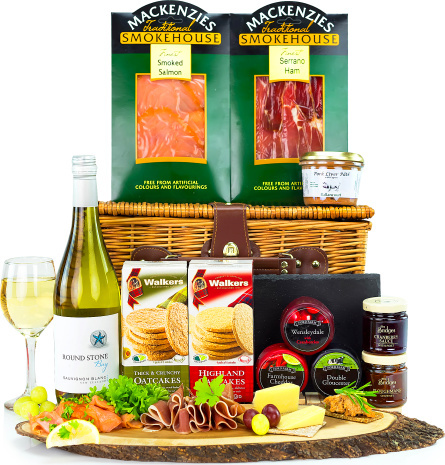 Our team has carefully selected the finest savoury treats to match the impeccable bottle included in this hamper. This Sauvignon Blanc comes from the Marlborough region in New Zealand which is one of the top winemaking areas in the country. The mild climate and fertile soil in these parts yield grapes that are rich in all the right flavours. Included are very fine waxed award winning cheeses along with excellent smoked salmon and very delicious serrano ham accompanied with biscuits to platform these amazing flavours. A truly sumptuous hamper perfect for celebrating Christmas in style.